Top Chef Masters: "The Lost Supper"
• Last week, I incorrectly stated that the judges were working on a four-star scale when in fact they all have the option of going as high as five. I was a bit confused because they were so stingy, with four stars as the maximum allotment even to Hubert Keller, who was innovative (and yes, maybe a bit unsanitary) in prepping his pasta in the shower. • Boy oh boy, am I loving Top Chef Masters so far. Those potential reservations I had last week about the drudgery of hitting the “reset button” for the first six weeks, the judges having to pull punches, and no real drama among the chefs are starting to evaporate quickly. The level of artistry and innovation on display is pretty mind-blowing at times, and the friendliness of the competition doesn’t make it any less competitive. Chefs of this caliber don’t get to where they are for being weenies. • I’m also learning to stop worrying and love the ratings system. Having to quantify the judging like that makes the selection of the challenge winners kind of a nail-biter. 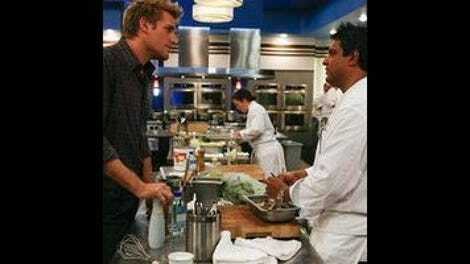 In regular old Top Chef, there wasn’t the same build-up. Quickfire: A redo of maybe the most memorable Quickfire of Season Two: The vending machine challenge, where each competitor is given a roll of quarters and has to make a dish out of snack food, prepackaged sandwiches, and the like. Any worries that these reheated “favorite” challenges would suffer from diminished returns were put aside this week, since the producers had the bright (if obvious, in retrospect) idea to bring back three Season Two competitors as judges, including lovable Neanderthal Michael, who famously insulted the guest judge by sticking a Cheeto into a fun-sized Snicker’s bar and calling it a day. Needless to say, the four super-chefs put forth a little more effort, with two of them opting to make a reduction out of Dr. Pepper. Of the four, Wylie comes in with the biggest reputation—for his many appearances on Top Chef, as well as his innovations in the emerging Frankenfood art of molecular gastronomy—but he falls shortest of the mark, thanks to a Dr. Pepper reduction that hardens on his (magnificently composed) plate. The big winner is stealthy Suzanne, who fried shallot rings, resurrected from the bitter ash of a Fritos bag, earns the first five-star rating of the season. Once again, all eyes were on Wylie Dufresne, who broke out a vaporizer and an immersion circulator to do his playful twist on the chicken and the egg paradox. As a guest judge on Top Chef, Wylie once mentioned his abiding love for eggs as an all-day foodstuff, and it’s clear his wizardry in turning an egg into a semisolid, “fudge-like” substance impressed the judges, as did his perfectly cooked (and also innovative) chicken. His low score on the Quickfire sealed his fate, but it’s worth noting that while the Lost crew only gave him 3 ½ stars, he scored highest among the judges—a feat that included earning the only 5-star rating doled out by one of them so far. So he at least walks away with his reputation for artistry intact. But how about some slow claps for Suzanne, the silent assassin, for amassing a higher score than even the vaunted Hubert Keller in the first episode? Her hearty “holiday dinner” of wild boar strip with oyster beer sauce, mango corn salad, and risotto with uni, clams, and prawns sounded pretty amazing, especially the smart touch of having the risotto in the center of the busy plate, soaking in all those flavors. Yum. • Tough business for Elizabeth Falkner, who didn’t get a chance to incorporate her pastry chef prowess into the challenges, and fell pretty far short of the mark. I would imagine that if the other three were required to play on her turf, she’d have had a better showing. • That said, Falkner’s yam papaya pudding sounded hideous enough from the description alone. Hearing from just about everyone that it went down like baby food deepened the nausea for me. • Chicago represent! Graham Elliot Bowles’ restaurant is one block away from The Onion office. Maybe a bit pricey for lunch, but I want to go to there.